Bar necklaces are all the rage! And what better way to show you are in style than with this engraved sterling silver bars and austrian crystals birthstone necklace. We have given the bars a brushed, matte finish for added sophistication. Select 4 names and 4 birthstones. The name is etched in a lower case font to give this necklace a modern feel. The bars and birthstones cluster at the bottom of the necklace to give it a stylish and contemporary look! 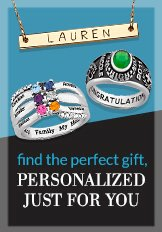 You can engrave up to 4 names, 8 characters each bar, and of course 4 birthstones of your choice. Each bar is 5mm x 28mm long. This pendant is suspended on an 18 inch sterling silver chain.